Karim Benyekhlef has been a professor in the Faculty of Law at the Université de Montréal since 1989. 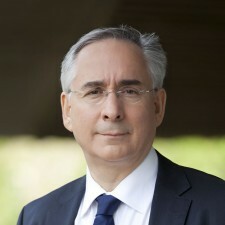 He has been seconded to the Centre de recherche en droit public since 1990 and served as its Director from 2006 to 2014. He was also the Director of the Regroupement stratégique Droit, changements et gouvernance (Strategic Law, Change and Governance Group), which brings together some 50 researchers, from 2006 to 2014. At the same time, he was the Scientific Director of the Centre d’études et de recherches internationales de l’Université de Montréal (CÉRIUM – the Université de Montréal’s International Research and Study Centre) from 2009 to 2012. He is now the Director of the Cyberjustice Laboratory, which he founded in 2010. He holds the Chaire de recherche en information juridique Lexum (Lexum Research Chair on Legal Information) and serves as a member of CÉRIUM’s science and advisory committees. Member of the Barreau du Québec (Québec Bar Association) since 1985, he practiced in the federal Department of Justice from 1986 to 1989. His teaching and research areas are constitutional law (human rights and freedoms), international law, information technologies law, legal theory and history of law. In 1995, Professor Benyekhlef founded the electronic law journal Lex Electronica (http://www.lex-electronica.org), the very first French-language online law journal. He also initiated the first online dispute resolution projects (the CyberTribunal Project, 1996-1999; eResolution, 1999-2001; ECODIR, 2000-today: http://www.ecodir.org). He now serves as Director of the Cyberjustice Laboratory, the work of which is designed to increase and facilitate access to justice, and he leads an international team made up of some 30 researchers from over 23 different universities in Canada, the United States, Australia and Europe: Rethinking Procedural Law: Towards Cyberjustice, a project funded by the Social Sciences and Humanities Research Council (SSHRC) of Canada in the context of the Major Collaborative Research Initiatives (MCRI) Program. He has also participated in developing good governance programs in Africa and the Caribbean (through the Canadian International Development Agency, the United Nations and the European Commission). With Professor Fabien Gélinas of McGill University’s Faculty of Law, he is the author of Le règlement en ligne des conflits. Enjeux de la cyberjustice (Paris: Éditions Romillat, 2003, available in English here: Online Dispute Resolution), and in 2008 he published Une possible histoire de la norme. Les normativités émergentes de la mondialisation, (A Possible History of Norms. The Emerging Normativities of Globalization). The latter was awarded the Prix de la Fondation du Barreau du Québec in 2009. In 2013, he edited a collective work entitled Gouvernance and Risk: The Challenges of Global Regulation, in 2016, Vers un droit global? (Towards Global Law?) and, the same year, eAccess to Justice, published by the University of Ottawa Press, and co-edited with Jane Bailey, Jacquelyn Burkell and Fabien Gélinas. He was the editor of a collective book published in 2017: Au-delà de la représentation: les figures de la démocratie (Beyond Representation: The Models of Democracy). His most recent work, with Pierre-Luc Déziel, published in 2018, is a casebook on the right to privacy in Quebec and Canada: Le droit à la vie privée en droit québécois et canadien, Montréal, Thomson-Reuters, 2018. This content has been updated on 29 January 2019 at 8 h 29 min.